Rexona, Unilever's top deodorant brand was launching a new and improved product, Rexona Antibacterial Defense in Jakarta, Indonesia. With an active anti-bacterial ingredient, this product provides instant protection against body odor. Rexona targeted 18 - 35 year old males at dusty crowded areas during the evening hours with the help of location, audience persona and time targeting to communicate with users that Rexona could help them feel refreshed after a long commute. A rich media ad unit incorporating augmented reality technology was created, giving users a complete 360-degree view of the bus stop they were approaching. Using advanced location targeting, Rexona was able to pull up 360-degree google images with the same lat-long as the user's current location. Through the 360-degree view, users could truly experience the moment and also understand the need for the Rexona Antibacterial Defense. This ad experience, nudged 13,000 users to download the coupon code and actually buy the newly launched product indicating that the campaign successfully grew top-of-mind awareness of the all new Rexona Antibacterial Defense. Ponds wanted to relaunch Ponds Acne 10-in-1 Solutions showcasing its superior product & breakthrough technology. This product was aimed at enabling women in Indonesia to feel confident about themselves by getting rid of the blemishes left behind from acne. With close to 60% internet penetration and 100% mobile penetration in the target audience, mobile formed a key part of the overall media strategy. In order to effectively share the campaign's message, front facing cameras on users’ devices were leveraged. 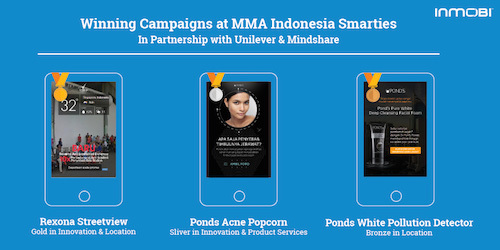 This helped Ponds to capitalize on ‘mobile-first' features creating an ‘augmented reality environment’ to heighten the user's experience. Using the phone’s front-facing camera to talk about skin care is a truly disruptive method compared to traditional methods of simply displaying messaging about a product. This campaign was thus the world’s first face detection augmented reality HTML 5 rich media unit to run on mobile phones. Users interacted with the ad unit more than 39,000 times with an average engagement time of 29 seconds. Ponds wanted to educate people about the Pure White Deep Cleansing Facial Foam, an anti-pollution cleanser that deeply cleanses and lifts dirt, dust and pollution from the skin. Ponds targeted young working female commuters during evening hours using audience persona targeting along with time and location targeting. With the help of advanced location data, the rich media ad gave users a real-time update of the pollution levels around them and warned users that dust particles on the street would make their skin look dull and tired. The ad unit displayed buildings with a layer of soot and polluted skies in the backdrop. Users were then nudged to blow on the ad unit, and this act cleared out the animated pollution images. Users were then shown the benefits of Ponds Pure White Deep Cleansing Facial Foam. More than 70,000 users interacted with the ad unit and close to 80% of those users actually visited the Ponds site. These campaigns demonstrate the power of cutting-edge and innovative mobile creatives. Using technology such as facial detection and augmented reality, Brands are able to provide truly mobile-first immersive moments for users.